The Digital Preservation Coalition will be hosting a seminar on PDF/A-3 and it's implications for digital preservation on the morning of the 13th March, straight after this hackathon. So please hang around in Leeds if that sounds of interest to you. Details and registration here. The twitter hastag for this event is: #sprucedp. We've collected comprehensive user needs from our previous SPRUCE events and have drawn some pretty clear conclusions about the top priorities. The practitioners have spoken: "We need better characterisation!" This hackathon will therefore focus on unifying our community's approach to characterisation by coordinating existing toolsets and improving their capabilities. Previous SPRUCE Mashup events have frequently featured practitioners requirements for simple to use characterisation solutions that deliver results that can be analysed or visualised in a variety of ways. This event will exploit developments from previous events as well as a variety of other tools in order to deliver a combined characterisation solution, encompassing both the characterisation of digital collections and the utilisation of the resulting characterisation data. Please view and contribute ideas to the scratch space for this event. The hackathon is suitable for anyone interested in doing some dev work with characterisation tools! We're expecting a number of the key faces behind the development of the big name tools we're all familiar with (including JHOVE, JHOVE2, DROID, FIDO, C3PO and FITS), so this will be a great opportunity to learn from them while contributing to advancing our DP capabilities. SPRUCE has a fund of £60k which it is making available in small awards of up to £5k to support digital preservation activities that follow on from SPRUCE events. There are more details here. These awards are usually aimed at supporting practitioners, but following this hackathon we will be opening a small call for bids from developers that attend the hackathon. Exact details are yet to finalised, but the aim will be to support, extend, productize or finalise promising work that was undertaken during the hackathon. This call will fund up to 2 awards of up to £5k each. Bid for a SPRUCE award here. From the train station it's a bit of a walk to the hotel so I'd recommend getting a taxi which should set you back about £5. From Leeds Bradford Airport it's about 20 minutes in a taxi which will cost you about £20. Exit the terminal building and book a taxi in the portacabin 100 yards in front of you (you can't miss it). If you plan to arrive by car, you'll need to contact me (email address the bottom of this page) so I can book a space for you in the car park. 2030, Sunday 10th March, Veritas Pub . This will be a chance to meet up, chew the fat and sample some local craft ales. All are welcome! 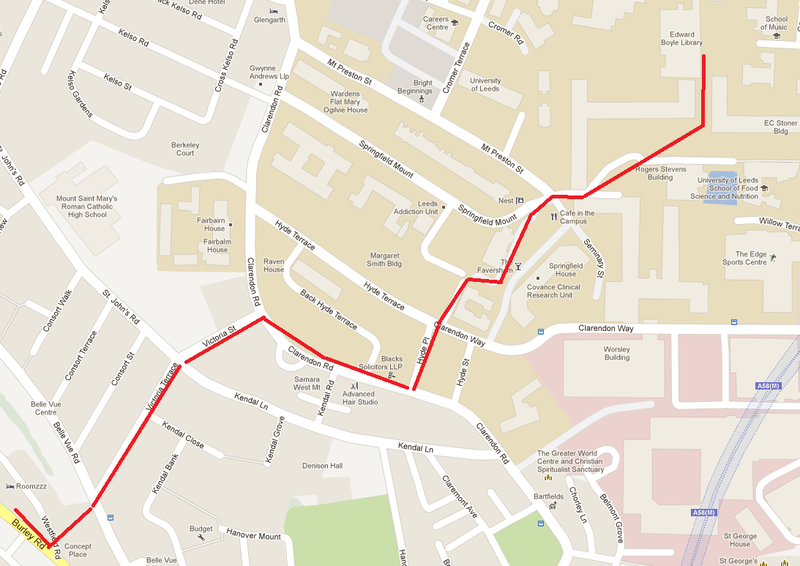 This is the route from the hotel , its about 15 minutes walk. I'd suggest that those that fancy going meet up in the hotel reception at 2015 first (note that I, PW, will see you in the pub!). I have booked the "Dining Room" for us, which is past the deli counter on the far left, as you enter the pub. Venue: Level 7 Conference Room, ﻿﻿Edward boyle Library , University of Leeds, Leeds, UK. Please sign in at the front desk on arrival. They will be expecting you. Start time: 0930, Monday 11th March 2013. Pizza, beer and late night coding will be available! Accommodation will be provided close to the University at Roomzzz City West (4.5 on Tripadvisor ), where you have indicated you need it on your registration form (Sunday 10th and Monday 11th). Roomzzz has free wifi and is only 15 minutes walk from the hackathon venue. How do I get from the Mashup to the hotel (and back)? It's about a 15 minute walk, and it does involve some navigation, so make sure you have a map to hand . Note that Google Maps will take you on a much longer route than is necessary! Can I suggest that you all meet up in the hotel reception at 9am on Monday morning, and walk in together. Note that I (PW) won't be there! Note that on Monday evening we will be eating pizza delivered by BoxPizza, which just happens to be situated next door to your hotel! Despite being ignorant, working class northerners , we do have a modicum of culture in this part of the world. So if you're looking for something to do on Sunday afternoon, I'd recommend checking out the City Art Gallery and the Henry Moore Institute which are both right in the centre of town next to the town hall (don't miss the stunning Tiled Hall Cafe). We also have the Royal Armouries on the other side of town if you prefer guns and stuff to art. If you feel the need to geek out we have an embryonic hackspace , but call ahead to make sure it's open. The final recommended option would be to get the train (20 minutes) to Bradford and visit the fabulous National Media Museum . Bradford is err somewhat gritty but it's worth the trip for the museum which has some great exhibitions and an Imax Cinema. Please fill out this feedback form for us. How do I register for the hackathon? You must be registered to attend the hackathon. All places for this event are now filled. Why not check out our mashup events?